grandma's cookie jar: give a gift - make a difference! 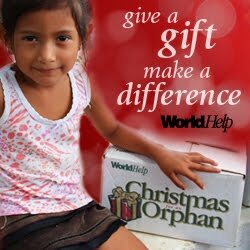 Yesterday I posted about involving your grandchildren in a project to fill a box with Christmas gifts for an orphan through WorldHelp's Christmas for an Orphan, so I talked with Josiah (my nearly three year old grandson) about how there are children around the world who do not receive even one gift for Christmas. I asked him if he would like to fill a box with gifts to send to another little boy so this boy will be able to have presents for Christmas. He said he wanted to do this and thought the boy should get a car! I said a matchbox car would be a good idea and he could go to the store with me to pick one or two out for him - of course Josiah thought this was a very good idea. He looked somewhat skeptical as to if toothbrushes, toothpaste and soap were good Christmas "gifts", but he is looking forward to filling the box when it arrives so another boy will have gifts! We also talked about the people who will give the box to a boy and how they will be able to do the most important thing . . . tell the boy Jesus loves him! Josiah agreed this little boy needs to know Jesus loves him! We are looking forward to filling a box with gifts for a little boy! We are also very happy this little boy - and the other children around the world who receive boxes through WorldHelp's Christmas for an Orphan - will be learning about Jesus and how much He loves them! Please join Josiah and me and give a gift; make a difference!